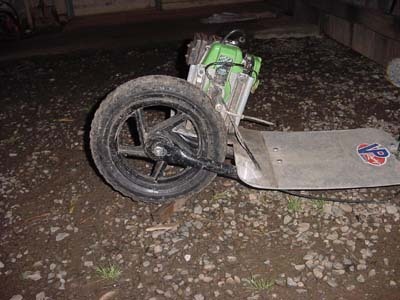 The motor on this scooter was mounted without any welding. It uses common right-angle brackets, and plate aluminium. It has a commercial scooter frame, which has attached a wider deck made out of a 1/4 inch plate of aluminum. The plate extends further on one side for the engine which is a small weed eater engine that is held on by two "L" brackets. The spindle is a peice of round tubing with mig welds on it to grip the tyre. I only have one photo at the moment, however this should change when Corey gets a chance to take some more pics.